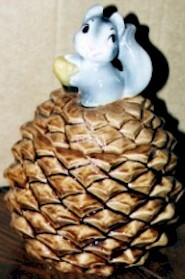 Squirrel on a Pinecone cookie jar by Metlox Potter. Marked "Metlox". We are currently out of stock on this item. If you would like to place a special request for this item, please email us.